Today I visited 12 Crosskey, a five bedroom home with two bonus rooms, both additions to the original house. This home has no HOA dues and no Mello Ross Tax. The house is in great condition, with many recent upgrades, including new wood floors downstairs and new carpet upstairs, new vinyl windows, and new tile floors and showers in the bathrooms. 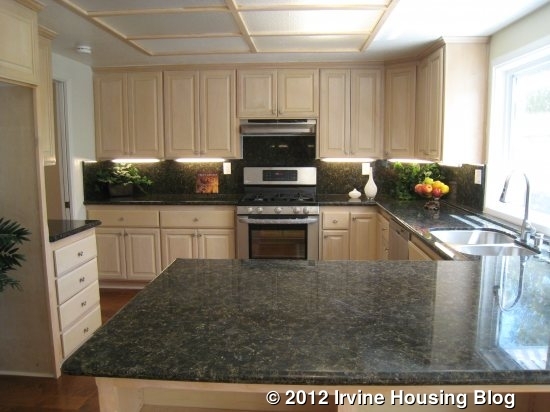 Other upgrades include new mirrored closet doors, recessed lighting, new fixtures, and a new wood patio. The first rooms I saw when I walked into the house were the living room and dining room, both on the left. Oddly, the living room still had furniture in it, though the rest of the house is completely vacant. 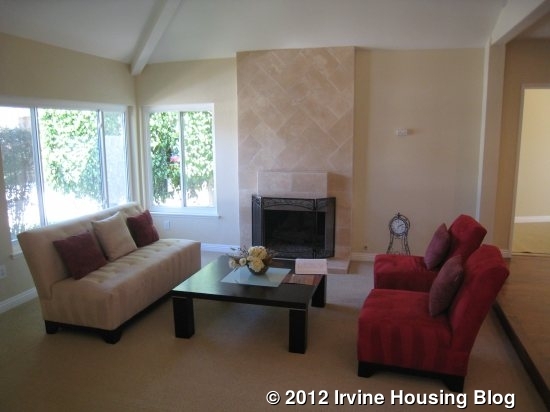 It is nice and bright, with an attractive fireplace and high ceiling. The living room is two steps down from the hallway and one step below the dining room, so there are several different levels within the downstairs of the home. Continuing down the hallway, I passed a large, wide staircase and entered the great room – a family room and a fully remodeled kitchen. The great room is very spacious, with a fireplace in one corner, a bay window in the breakfast nook and pretty wood floors. It has a walk-in bar and an open storage area under the stairs. The kitchen has brand new stainless steel appliances (no fridge), new granite countertops, maple cabinets, and a large breakfast bar with bookshelves on one side. It’s a fairly small kitchen in terms of floor space, but it does seem to have ample counter and cabinet space, including a pantry. A bonus room was added on downstairs, behind the dining room. It’s a triangular shaped room, fairly narrow at one end, with doors to close it off from the dining room if desired. It also has sliding doors to the backyard. This would make a great playroom for little kids and could also be used as an office or exercise room. Its size, shape and lack of closet wouldn’t make it ideal for a bedroom. 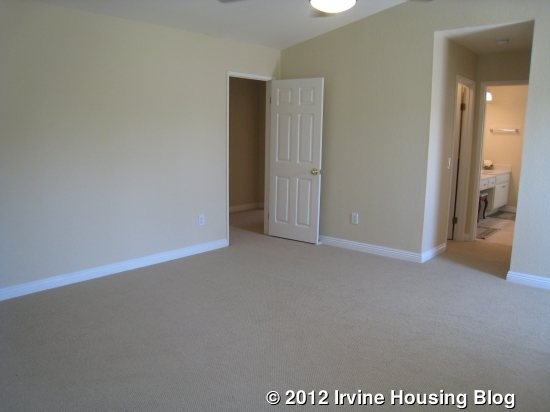 There is also a full bedroom downstairs with mirrored closets and a ceiling fan. The full bath downstairs has two sinks and a shower. Upstairs, I found three more secondary bedrooms. Each has mirrored closets and they share a bathroom featuring two sinks and a tub/shower combo. One has a ceiling fan. They are average size and don’t have any special details. The master bedroom is a big room with a ceiling fan and high ceilings. Two tall, narrow windows overlook the backyard. It has two cedar-lined walk-in closets, providing ample storage and a nice aroma. Past the closets is a remodeled bathroom, with a separate tub and shower and two sinks. 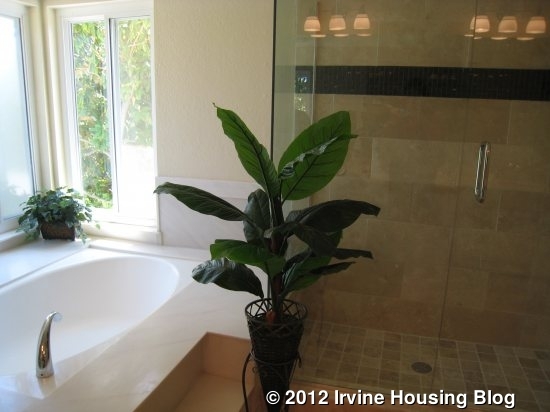 The floors and shower are beautifully retiled and all of the fixtures are new. The cabinets appear to be original but are in good condition. The other addition to the house is upstairs through the master bedroom. It is approximately the same size as all of the secondary bedrooms but it lacks a closet. Because it is only accessible through the master bedroom, it somewhat limits what you would use it for, but it would make a nice office, exercise room, or private sitting room. It’s a nice extra space to have. 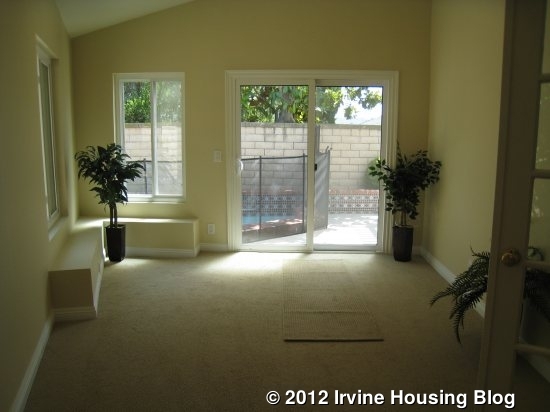 The home’s biggest downfall is a fairly small backyard, partly due to the downstairs bonus room. 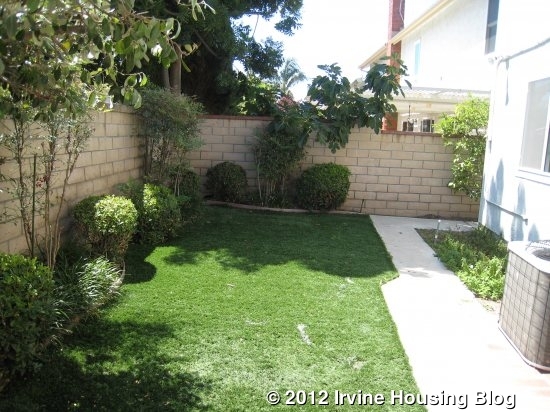 However, it does still have a grassy area, a patio, and a fenced-in spa. I like this house a lot. It is at the end of a quiet cul-de-sac and all of the upgrades are attractive and well done. 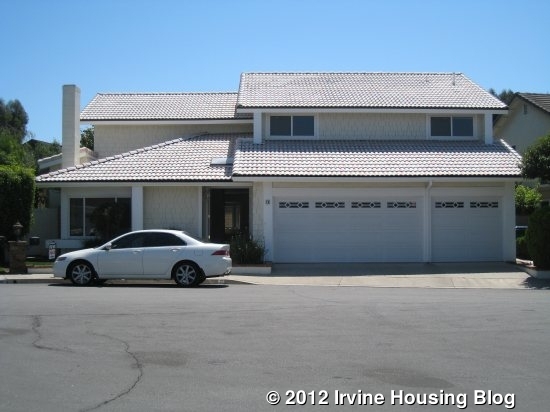 There is plenty of living space for a large family and it has a three car garage. The house has only been on the market for about a week and I imagine it will sell fairly quickly. 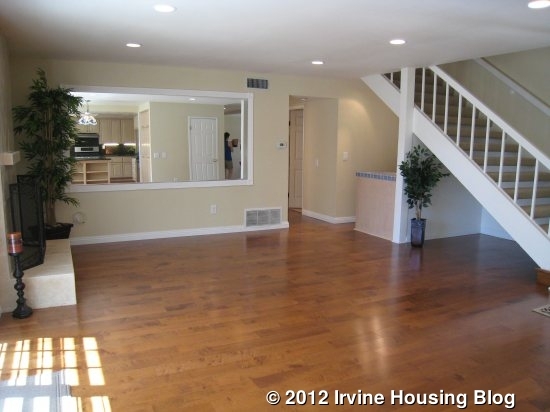 This entry was posted in Real Estate Analysis on July 19, 2012 by Karen.